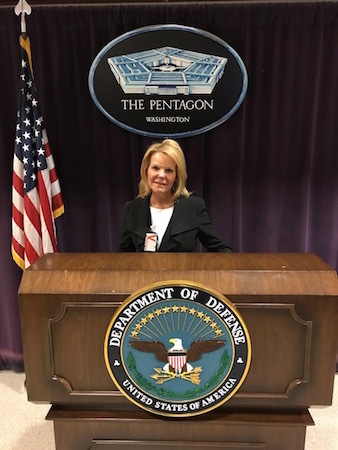 Mark T. Esper, U.S. Secretary of the Army, has selected Tammy Carnrike to represent Michigan’s southern district as the newest civilian aide to the Secretary of the Army (CASA). Carnrike was invested during a ceremony conducted this week at the Pentagon. In her new position, Carnrike will be afforded a three-star protocol status in accordance with the U.S. Department of the Army Protocol Precedence List. She will provide advice to Esper, commanders, and senior leaders on public sentiments towards the Army. Additionally, she will work closely with the Army and installation commanders, state adjutants general, ambassadors of the Army Reserve, Army National Guard and Army Reserve commander, Reserve Officers Training Corps region and area commanders, Army recruiting commanders, professors of military science, U.S. Army Corps of Engineers Division and district engineers, and other designated personnel within Michigan. Carnrike has been a leader in chamber of commerce management for more than 20 years and has been chief operating officer for the Detroit Regional Chamber since 2006. Additionally, she has held national leadership positions, including chairman of the U.S. Chamber’s Institute for Organization Management Board of Trustees and chairman of the board for the Association of Chamber of Commerce Executives. Each state, the District of Columbia, and the five U.S. territories have one or more CASAs appointed. Typically, CASAs are business or civic leaders with a keen interest in the welfare of the Army and its communities. Carnrike also serves as a member of the Army-Southeast Michigan Advisory Council; is a member of the Governance Committee, Protect and Grow: A Strategic Plan for Michigan’s Defense and Homeland Security Economy; and is an alumna of the Department of Defense’s Joint Civilian Orientation Conference. CASAs serve a two-year term without compensation. Terms can be extended for a total of 10 years of service. Civilian aides may be recognized CASA Emeritus after 10 years of distinguished service.